On last Friday, we went to the D-22 in Northwest Beijing, near Peking U and Tsinghua, to catch the You Say Party! We Say Die! show. 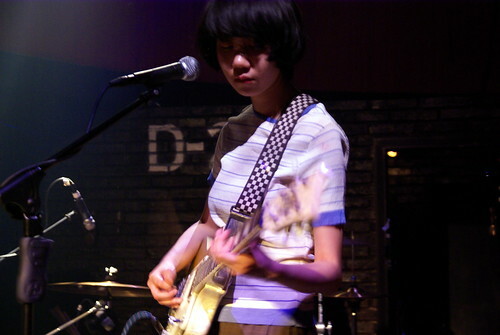 Perhaps more well-known to the Beijing audience was the opening band, Ourselves Beside Me (sic), a girl trio formed in early 2008, notably by ex-Hang On The Box bassist Li YangFan. I first heard of HotB last summer, in Beijing Bubbles, the documentary film I always quote when talking about the Beijing rock/punk scene. It was only after reading up on Ourselves Beside Me that I realized that one of its members was with HotB. The name of the band in fact comes from the last track of the last album released by HotB in 2007, prior to its demise. >> Listen to the entire Ourselves Beside Me show at D-22 on 2008-04-18 – 14 Mb. Their music is not as loud as HotB, if it is a measure for comparison, and it actually reminds me of stuff that I used to listen to way back in 2001, like Buffalo Daughter. From what I gather through the articles, OBM is so new that they don’t sound the same at each performance that they had so far.